Song of a Linne’s Cicada (scroll down for explanation and additional recordings!). 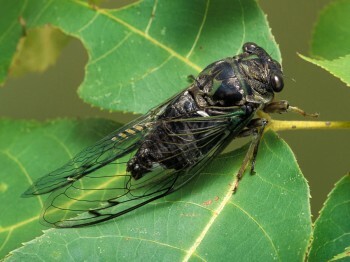 An inhabitat of deciduous forest throughout much of the East and Midwest, Linne’s Cicada is often common in city woodlots and parks, where nymphs emerge from burrows at night in midsummer, climb the trunks of trees, and then pause to shed their skin. Newly emerged adults are a wonder to behold. Soft and delicate to touch, they appear translucent and are bright blue-green in color. There is a prominent bend along the lower edge of the wing that is distinctive. Once emerged, a young adult remains mo- tionless for an hour or two as it dries its new exoskeleton, expands its wings, and darkens in color. If there are Linne’s Cicadas in your town, look for this miracle of nature an hour or so after sunset on the first nights after you have heard males singing. Song: High-pitched and rapidly pulsating. Begins softly but quickly increases in volume, then becomes a steady pulsating rattle sounding like a saltshaker, before ending abruptly. Sometimes continues to buzz softly between songs. Peak frequency is about 7 kHz and song length about 15 seconds. Sings all day long during warm spells. Sonogram of a Linne’s Cicada. © Wil Hershberger.